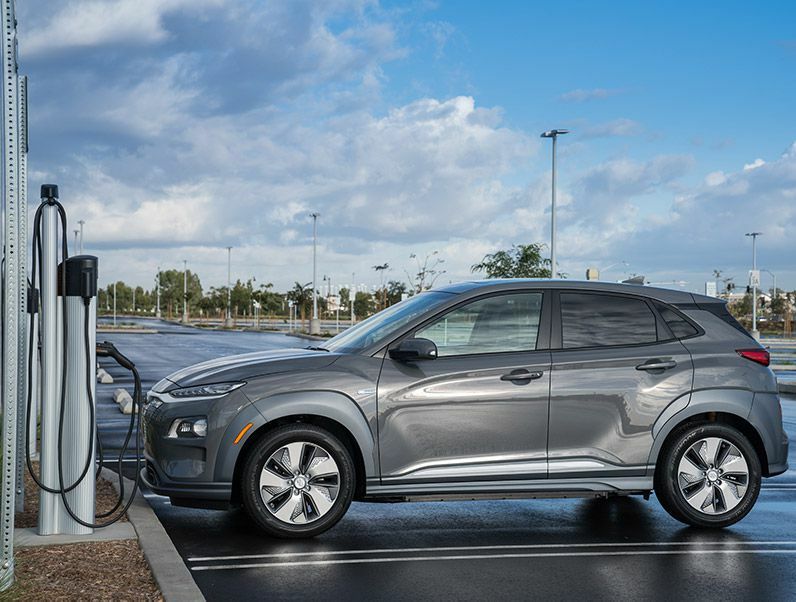 The new face among electric vehicles might not be the most attractive we’ve ever seen — arguably Hyundai designers went a little far with the grille-less front end — but the new, all-electric version of Hyundai’s smallest crossover utility vehicle, the Kona Electric, has a lot to recommend it. As it enters the market, the Kona Electric’s range-before-recharge is longer than any other EV on the market with the exception of the very expensive Teslas. Its range is just one of its positive features. As a crossover, the Kona offers an elevated driving position and a surprising amount of interior space for a vehicle its size. Its ride and handling are more sporting that we had any right to expect, and its torquey acceleration is wonderfully linear and decently quick. The Kona Electric can be equipped with an impressive array of driver assistance features, and its interior is functional, comfortable and quiet, with none of the irritating whine of earlier EVs. The front end grabs attention. We might accuse the Kona Electric’s designers of trying a bit too hard with its “debossed” grille replacement that resembles industrial flooring. The fascia hides a conveniently located electric charging port that enables you to pull up to charging stations easily. While the front end might be a bit much, the remainder of the Kona Electric is quite attractive in the upright, crossover-utility tradition. Its flared fenders offer a performance lilt to its design, and the rear fenders contain taillight units that complement the hatch-mounted taillights. In fact, the lighting treatment has been so carefully worked out, both front and rear, that it is not disingenuous to say the Kona Electric looks better in the dark than it does in daylight. In total, the Kona Electric does a good job conveying that it’s not like every other vehicle on the road without resembling a giant toad, and its 0.29 coefficient of drag is laudable. 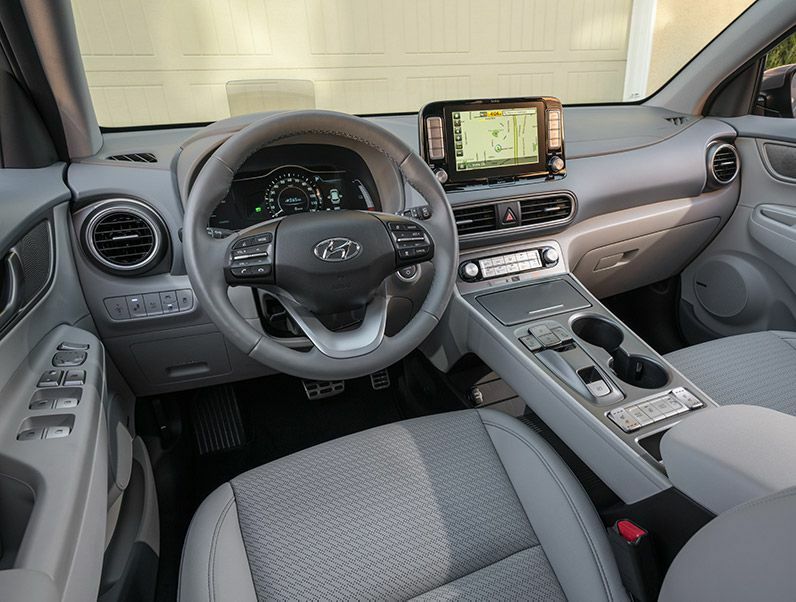 With a few notable exceptions, the Kona Electric’s interior appears very conventional, and that’s a plus. Rather than shouting the fact the driver and passenger are in a “future-car” as some EVs do, the Kona Electric lets its tech go understated. The most distinctive interior feature is the shift-by-wire drive control in the center console above an open storage bin that’s easy to access… if you’re a contortionist. Below the touchscreen are easy-to-grasp (literally and figuratively) heating, ventilation, and air conditioning controls. Automatic temperature control is standard across the board. The driver’s seat in the base SE trim is six-way manually adjustable, while it’s eight-way power-adjustable in the Limited and Ultimate trims. If you want a black interior, you’ll have to make do with cloth seats. A light gray and blue dual-tone leather color scheme is the other interior option. The Hyundai Kona offers a pair of infotainment systems, both of which are intuitive to use. The SE model features a 7-inch touchscreen, accompanied by dedicated buttons and knobs that simplify operation, especially when in motion. 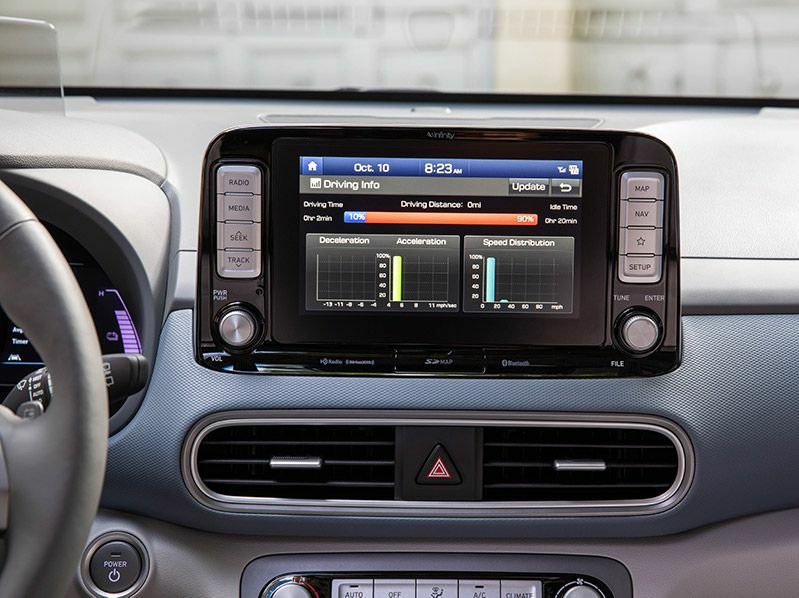 The standard sound system is AM/FM/MP3 audio with six speakers plus SiriusXM/HD Radio. The Limited adds a 315-watt Infinity audio with Clari-Fi music restoration technology. It has an external amp and a total of eight speakers — front-door-mounted speakers, two tweeters, two rear speakers, a center front speaker, and a subwoofer. The Ultimate trim level offers the Infinity sound system, plus an 8-inch touchscreen with onboard navigation, traffic-flow information, and incident data via HD radio. 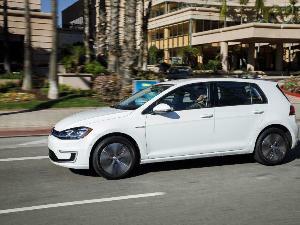 A head-up display and wireless device charging are also offered. 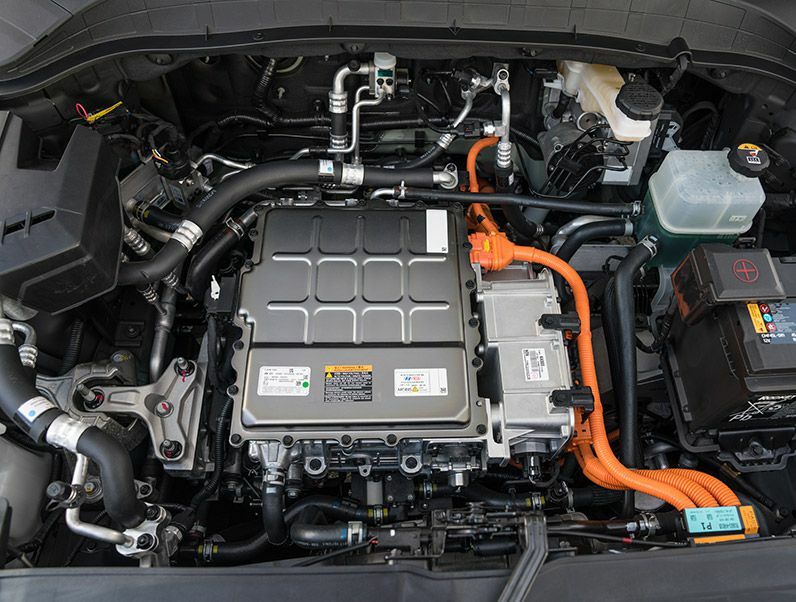 The Kona Electric powertrain features a 201-horsepower (150 kW) permanent-magnet synchronous electric motor drawing as liberally as the driver wants from a high-voltage 64 kWh lithium-ion battery. The motor delivers a maximum of 291 lb-ft of torque to the front wheels, and that torque is available virtually from the instant you step on the accelerator. The battery is liquid-cooled and operates at 356 volts. Battery pack energy density is an efficient 141.3 Wh/kg, with a total battery system weight under 1,000 pounds. The Kona Electric uses a standard Level-II onboard charging system capable of a 7.2 kW rate of charge for rapid recharging characteristics. An 80 percent charge can be achieved in under one hour with a Level-III quick charge using the SAE-Combo charging port, while with a 7.2 kW Level-II charger a recharge takes 9 hours and 35 minutes. 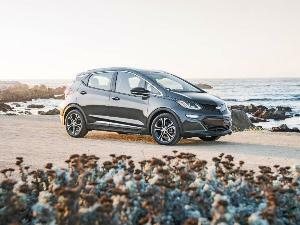 The Kona Electric’s estimated range is 258 miles. 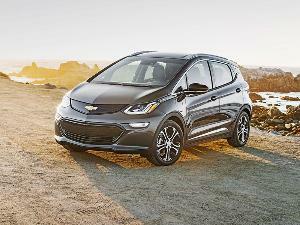 Its EPA-estimated miles per gallon equivalent (MPGe) is 132 city, 108 highway, and 120 combined. Because the Hyundai Kona was designed from the beginning to accommodate an all-electric powertrain and accompanying battery pack, special care was made to ensure that it delivers good interior space and cargo-carrying ability. Total interior volume is 113.3 cubic feet, and passenger volume is 94.1 cubic feet. 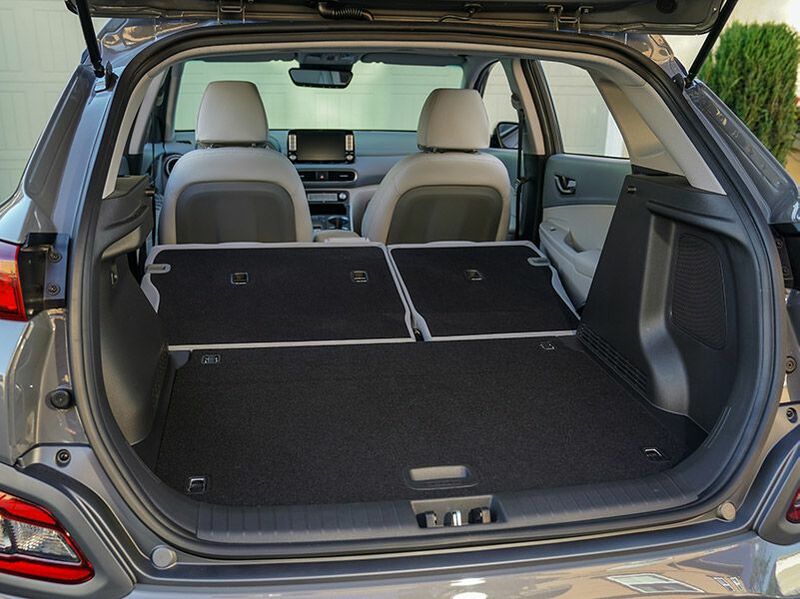 With the rear seat folded, it offers 45.8 cubic feet of cargo volume, about 10 cubic feet less than the Kia Niro hybrid. With the second-row bench seat in use, that number shrinks to 19.2 cubic feet, virtually the same as the Niro. A tradeoff for the un-SUV-like 6.2 inches of ground clearance is low lift-over height for loading cargo. If you plan to tow, we suggest buying the non-EV version of the Kona. As befitting a high-technology vehicle, the Hyundai Kona Electric is equipped with an impressive list of safety gear. Included are forward collision-avoidance assist, a driver attention warning, adaptive cruise control, a blind-spot monitor, lane-keeping assist, and rear cross-traffic collision-avoidance. The Kona Electric also features a standard rearview monitor with parking guidance, vehicle stability management, electronic stability control, brake assist, and traction control. In terms of passive safety, the Kona Electric has driver and front-passenger advanced airbags, and driver and front-passenger seat-mounted side-impact airbags. Available high-beam assist automatically controls the high-beam headlights depending on surroundings, while the driver attention warning system monitors driver-related characteristics to help detect fatigue and careless driving. 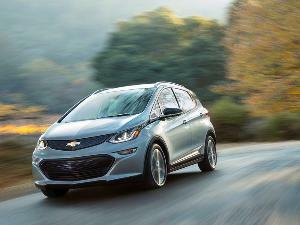 When you drive an electric vehicle, you realize how smooth and linear acceleration can be. 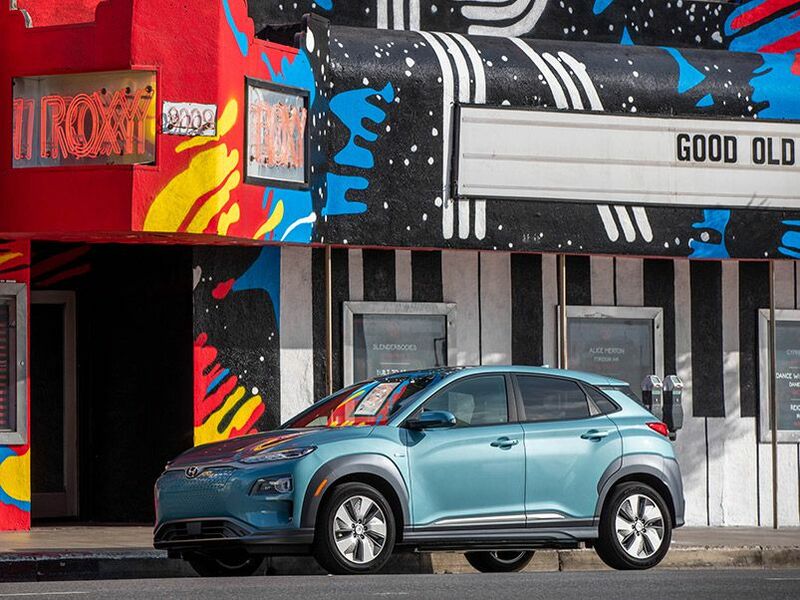 With its single-forward-gear transmission, the Hyundai Kona Electric just keeps adding power as you push farther and farther on the accelerator (don’t call it “gas”) pedal. The feeling is uncanny but very pleasant. With Drive Mode Select, you can customize dynamic responses, including steering feel and overall powertrain responsiveness to your preferences, and you can change them at will. The three driving modes — Normal, Eco, and Sport — alter torque distribution, tailoring the vehicle’s performance to pre-determined parameters. In Sport mode, the emphasis is on acceleration, while Normal and Eco modes progressively prioritize range over performance with more conservative power-delivery strategies. 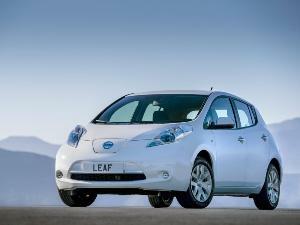 Less fun equals more driving miles on a charge. With its multi-link rear suspension and low center of gravity, the Kona Electric feels “heavy” but well-connected to the road. 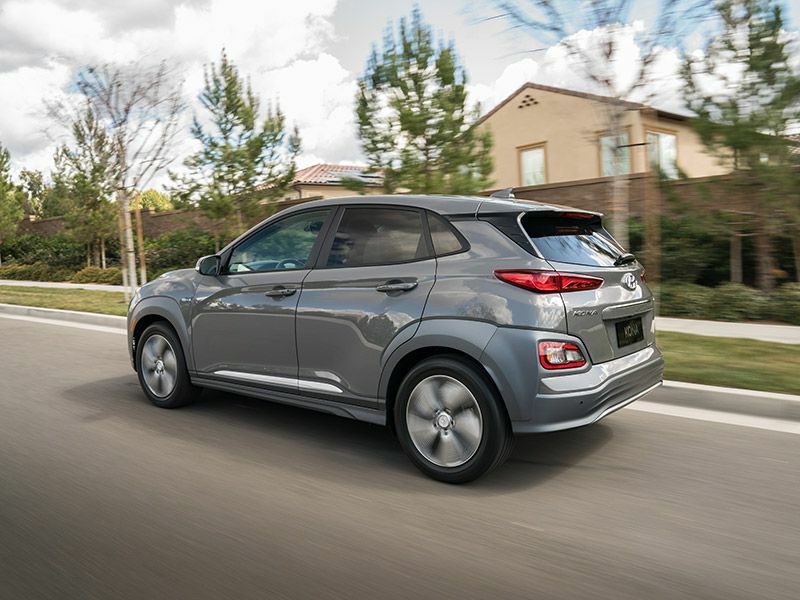 The 2019 Hyundai Kona Electric is available in three trim levels — SE, Limited and Ultimate. The SE is the gateway to the all-electric Kona with a good assortment of standard equipment. Included on the list are projector headlights, intermittent wipers, power windows and locks, and automatic temperature control. The Limited model will probably suit a wide variety of buyers with its well-chosen list of additions. On top of the SE’s equipment, it adds LED headlights, high-beam assist, an eight-way power driver’s seat, and the Infinity premium sound system, among other niceties. And if you’re seeking the Kona Electric with all the buzzers-and-tones, you will undoubtedly want the Ultimate. The Ultimate is the “all-in” trim, and its vast list of standard items includes the Infinity eight-speaker infotainment system with an 8-inch display and navigation, real-time traffic monitoring, a wireless phone charger, and a whole slew of safety and driver-assist features. 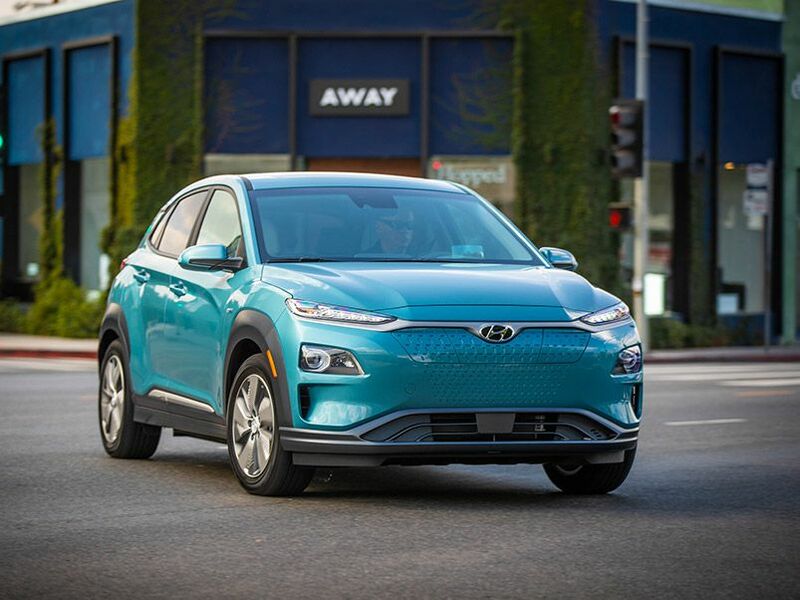 With its segment-leading range, the Kona Electric is a welcome addition to the list of EVs on the market. It makes us wish it were more widely available. 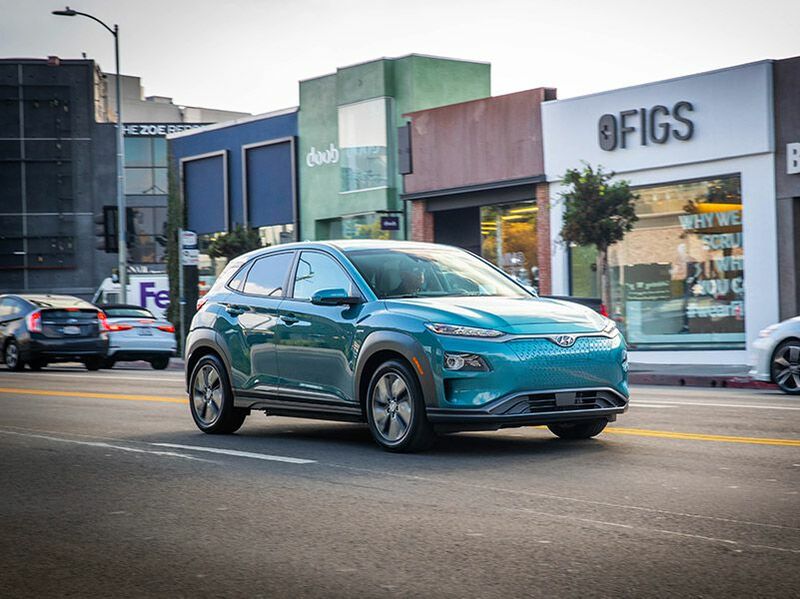 For 2019 Kona Electric models will go on sale initially in California and subsequently in the zero-emission-vehicle states in the western and northeastern regions of the U.S.
As of this writing, the Kona Electric has not been priced. We expect the SE trim to have a base price around $35,000. The Limited is likely to start around $40,000, and a top-of-the-line Ultimate trim should be around $45,000 or so. 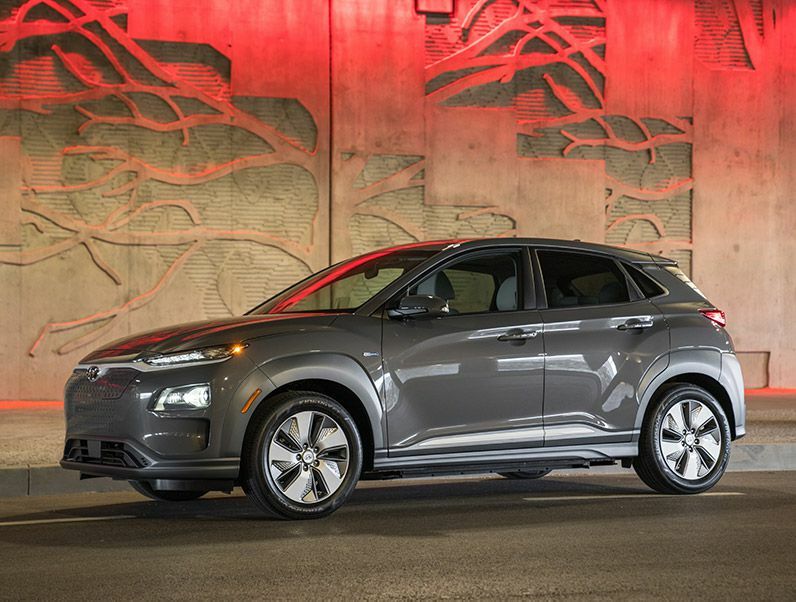 Buyers of the Kona Electric will qualify for a federal tax credit of up to $7,500. State and local incentives in the form of rebates and tax credits are also often available. At its price and with the range it offers, the Kona Electric could be an appealing opportunity.